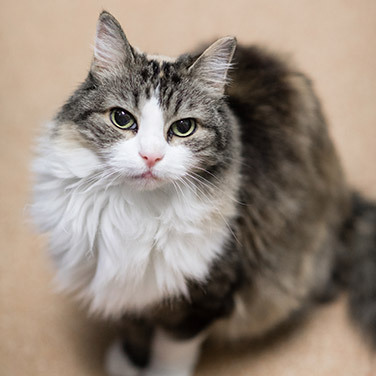 Missy Moo is Valley Verde Veterinarians’ resident long-haired calico princess. She was born in 2000 and was surrendered to the Green Valley Animal League in 2011. She was cared for at Valley Verde Veterinarians while being under the weather and, according to Valley Verde Vets legend, she never left. She’s made this clinic her home and is a constant big personality in our clinic family. She loves to meet pets and their owners in the lobby; the reception desk is one of her favorite perches. If you don’t see her in the front of the clinic, she may be napping or bathing on her chair in the doctors’ office, an activity she spends much of each afternoon perfecting. She can also be seen wandering the halls and the treatment area, keeping a close eye on the staff and making sure everyone is doing their job.